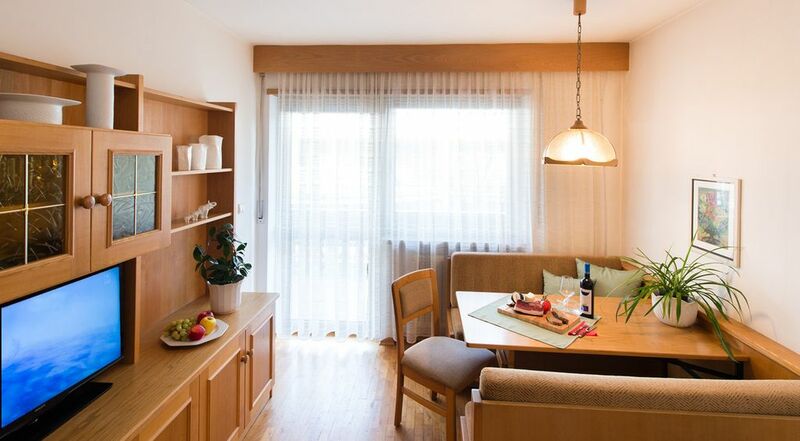 Only 3 km from the centre of the popular city of Merano, the Venti apartment is located in a large holiday farm in the village of Algund and promises relaxing holidays in the midst of the mountains of South Tyrol. The Residenz Josefshof consists of a total of 20 apartments and enchants guests with a great outdoor area and balconies beautifully decorated with flowers, which give the house a particularly cozy impression. This holiday apartment faces south, has a balcony and is located on the 1st floor. It consists of a an open living room with a sleeping area, as well as a kitchenette and a bathroom and can accommodate 2 people and a child. It also has Wi-Fi, cable TV, a cot and a highchair (the latter two are available upon request). Outside you will find a beautiful, shared garden and a pool equipped with sun loungers and umbrellas for a relaxing holiday under the northern Italian sun. Due to the central location in the village, shops, restaurants, bars and cafés are only 300 m or 3 minutes on foot away. The centre of Merano also offers a wider choice of shops, restaurants and leisure activities, which can be reached in 7 minutes by car. Enjoy the fresh snow in the Merano 2000 ski area, which is 15 minutes by car from the property. Parking is available on the property and a garage can be rented for a fee upon request. Dogs are allowed (upon request, for a fee). Bed linens and towels are included in the price. The pool is open from May to September depending on the weather conditions. The use of the washing machine is for a fee. A cat lives on the farm.